Four of the most adored players in Texas baseball history will adorn the three-card set being distributed by Donruss Trading Cards via wrapper redemption during the 2004 Major League Baseball All-Star FanFest July 9-13 in Houston. 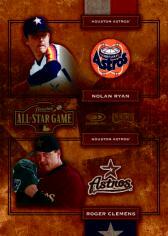 In addition to a Jeff Bagwell game-worn jersey card, Donruss will produce a Craig Biggio single card and a dual-player card honoring arguably the state's greatest all-time hurlers, Nolan Ryan and Roger Clemens. 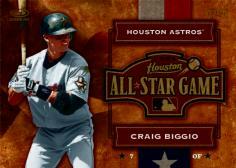 To obtain the Biggio and Ryan/Clemens cards, show goers must open five packs of any 2004 Donruss, Playoff or Leaf baseball products at the company's booth and exchange the wrappers (five for each card). 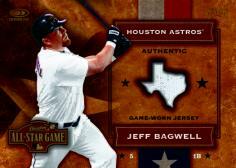 To obtain the Bagwell card, collectors must open five packs of premium 2004 Donruss, Playoff or Leaf baseball products. A list of qualified premium products will be announced at a later date. "This lineup, in particular, is a dream-come-true for Astros fans, and a great historical timeline of the team," says Rob Springs, Donruss' director of product development. "You have the history represented with Nolan Ryan, a segue into both the past and present with Biggio and Bagwell, and the most recent Astro with Roger Clemens. All four of these guys are or will be in the Hall of Fame. We couldn't be happier presenting the collecting public with these unique collectible cards for MLB FanFest."